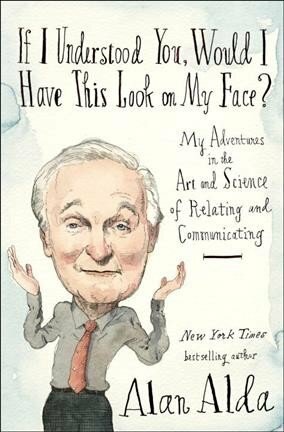 Alda's book hits bookshelves on Tuesday June 6, 2017. Random House, 213 pages. "People are dying because we can't communicate in ways that allow us to understand one another," he writes. "It sounds like an exaggeration, but I don't think it is. When patients can't relate to their doctors and don't follow their orders, when engineers can't convince a town that the dam could break, when a parent can't win the trust of a child to warn her off a lethal drug. They can all be headed for a serious ending." 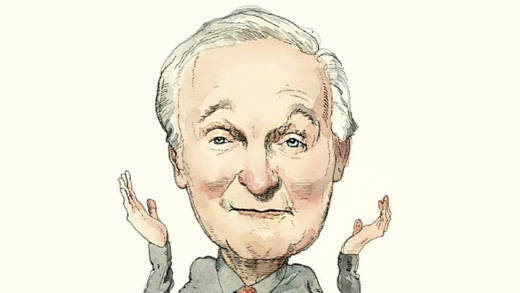 Alda explains why empathy is crucial to successful science conversations, and describes his work at the Alan Alda Center For Communicating Science. I was at a dentist's office in the chair ready to have him start an operation on my gum. So he's got the scalpel ready to poke me in the face with it. He says, "Now, there will be some tethering." I said, "Pardon me?" He said, "Tethering, there will be tethering." I said, "What do you mean tethering." He said, "TETHERING! TETHERING!" He started barking at me. I was too impressed by his surgical gown to say, "Put the knife down and tell me what you mean by tethering." I let him go ahead with the operation and it turned out that it changed my smile, because he cut the little tissue between the upper part of your gum and your upper lip. And I was making a movie a couple of weeks later, and the cameraman said, "What are you sneering about? I thought you were supposed to smile." But it turned out that when I told the dentist that maybe it would be a better idea to tell people what was going on, firstly he said, "I told you there were two steps to the operation." And then he sent me a letter trying to maneuver me off of a lawsuit. And I had no interest in a lawsuit. I just wanted him to communicate better with his patients. First of all, it's not to encourage them to be funny. ... It doesn't make them comedians, it doesn't make them actors. The reason for the improv exercises is to really get everybody accustomed to the idea that contact with the other person is essential, is a first step toward good communication. Because if you are thinking only about communication as having the perfect message regardless of how it lands on your audience, then you're likely just to be spraying information at them and not really saying something to them that sticks. I followed the same path that humanity did, which was to start with superstition. I was interested in things like spiritualism and astrology, and one of the books I was reading was supposedly written by someone who had been dead for a couple hundred years but written recently through a medium. And I thought, if any of this is true, the physicist who lives across the street would probably know the answer. And I asked him about it and he said, "I don't know, doesn't sound familiar to me." So I said, maybe the answer's in the Scientific American. And I started reading that, and I think one of the things that attracted me, engaged me right away, was that I saw there was a completely different way to think and to weigh things, which was on the basis of observation and evidence. And there's something deeply moving about it and entertaining at the same time. That's what I'm trying to get scientists to do — to share that excitement and passion that they have with those of us who don't do that for a living. I think it's at least partly a communication issue. Trust is really important, because ... we [don't] have the time in our ordinary lives to get up to speed on ... nanoscience or quantum mechanics. It's kind of important to have trust that we feel toward those people who have spent their lives doing that. Science and the public have separated so much that many people in the public consider science just another opinion. I think many of us feel: "Wait a minute, you told me a year ago red wine was good for me. Now you're telling me it's not. ... What's going on here? Can't you make up your mind?" ... That's also a communication question. I think there are basic things about science that people should be helped to understand. For instance, any one study is not supposed to arrive at the truth for all time. It gets us a little closer to truth. Almost every research paper that I read says at the end: "More research is called for." I wish articles about science would include that more. This is not the final word. It's a beautiful experience to learn what science is up to. It's just, just wonderful. So I recommend to anybody to open their mouths and let the hook catch them. Radio producer Ian Stewart, radio editor Ed McNulty, web producer Beth Novey, and Shots editor Nancy Shute contributed to this report.